Brighton's Solly March attempts to burst past Man United's Diogo Dalot. Picture by PW Sporting Photography. Paul Pogba opened the scoring from the penalty spot, before Marcus Rashford marked his 150th appearance for United with a goal to give the home side a 2-0 lead at the break. Glenn Murray and Ander Herrera looking to contest the ball. Picture by PW Sporting Photography. Pascal Gross added a consolation goal for the Seagulls in the second period but they couldn't find that elusive equaliser. Brighton boss Chris Hughton named the same starting XI that played in their 1-0 home defeat to table-toppers Liverpool last weekend. Manchester United caretaker manager Ole Gunnar Solskjaer meanwhile was set to name an unchanged side following their 1-0 away win over Tottenham Hotspur last Sunday, but Luke Shaw pulled out minutes before kick-off through illness with young Portuguese full-back Diogo Dalot replacing him. United had the game's first shot on goal on three minutes. Ander Herrera was brought down on the edge of the box by Dale Stephens to give the home side a free-kick in a promising position but Pogba's subsequent attempt hit the Brighton wall. Paul Pogba strokes his penalty past David Button to give Manchester United the lead. Picture by PW Sporting Photography. The Seagulls had their first sight of goal two minutes later. Gross' diagonal ball found Solly March who cut the ball back to Jurgen Locadia but his deflected strike was easily taken by United 'keeper David De Gea. The first clear cut opportunity of the game came on 20 minutes and it was for the hosts. Herrera played a lovely through ball to the onrushing United captain Ashley Young down the right hand side. His cross squirmed through the legs of Lewis Dunk to find Rashford but his goalbound effort was bravely headed away by Shane Duffy. A mere minute later, poor Albion defending contributed to another chance for the Red Devils. Stephens was unable to properly clear his lines, and the ball looped up for Pogba whose audacious overhead kick was inches wide of the post. After this serious spell of pressure, United went ahead on 27 minutes. A good ball from Nemanja Matic found Pogba in the box and his exquisite first touch took him past Gaetan Bong but the Cameroonian defender clumsily brought down the World Cup-winning midfielder and a penalty was awarded. Marcus Rashford celebrates United second goal on his 150th appearance with Diogo Dalot. Picture by PW Sporting Photography. Pogba stepped up and, with his trademark stuttered run up, fired past David Button to give the home side the lead. Brighton did respond well as they peppered the United box with crosses and Glenn Murray, largely anonymous for the opening stages of the first half, dragged a shot wide from the edge of the area. On 33 minutes a long ball out of defence from Victor Lindelof was taken deftly by Anthony Martial in the penalty area but Button produced a marvellous sprawling save to deny the French winger. The home side did double their lead four minutes before the end of the first half. Dalot stormed past March down the left flank feeding the ball to Rashford in the box. The England forward twisted and turned in the area, beating Gross all ends up, before calmly stroking the ball past Button to continue his rich vein of goalscoring form under caretaker boss Solskjaer. As the second half began, United had a superb chance to add a third on 53 minutes. Rashford flashed a tantalising ball into the box for Jesse Lingard, who only needed to tap the ball home, but he fired his shot wide of the post. Three minutes later, Martial sidestepped past Gross on the edge of the box and let off a venomous strike. The outstretched Button couldn't get close to the Frenchman's strike but the ball went inches wide of the left hand post. 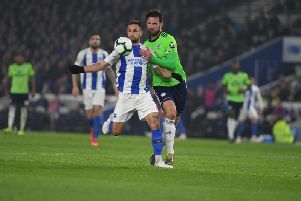 Seagulls boss Hughton made a double substitution on the hour to inject some fresh impetus into his struggling team as Anthony Knockaert and Florin Andone replaced March and Murray. Worryingly for Albion, Murray has now gone eight Premier League games without a goal - his longest barren run for Brighton in the division. After a somewhat pedestrian and passive performance from the visitors, the two subs seemed to galvanise the visitors. The visitors found themselves just a goal away from parity on 72 minutes as Davy Propper played a superb outside-of-the-foot cross into the box for Gross. The German took the ball down well with his chest and fired in off the crossbar to make it 2-1. Brighton were now in the ascendancy and began to pressurise a nervy Manchester United backline as Albion swamped the home side in their own half. Five minutes before the end, substitute Beram Kayal fired in a free-kick deep into the area which De Gea had to punch away to stop an incoming Duffy from heading home but, in truth, the Seagulls struggled to fashion any gilt-edged chances as United held on to win. Manchester United: De Gea, Young, Lindelof, Jones, Dalot, Matic, Herrera, Pogba, Lingard (Mata 75'), Rashford (Darmian 90+3'), Martial (Lukaku 83'). Unused subs: Romero, Bailly, Pereira, Alexis. Brighton & Hove Albion: Button, Montoya, Duffy, Dunk, Bong, Stephens, Propper, Gross (Kayal 82'), March (Knockaert 60'), Murray (Andone 60'), Locadia. Unused subs: Steele, Bruno, Balogun, Gyokeres.